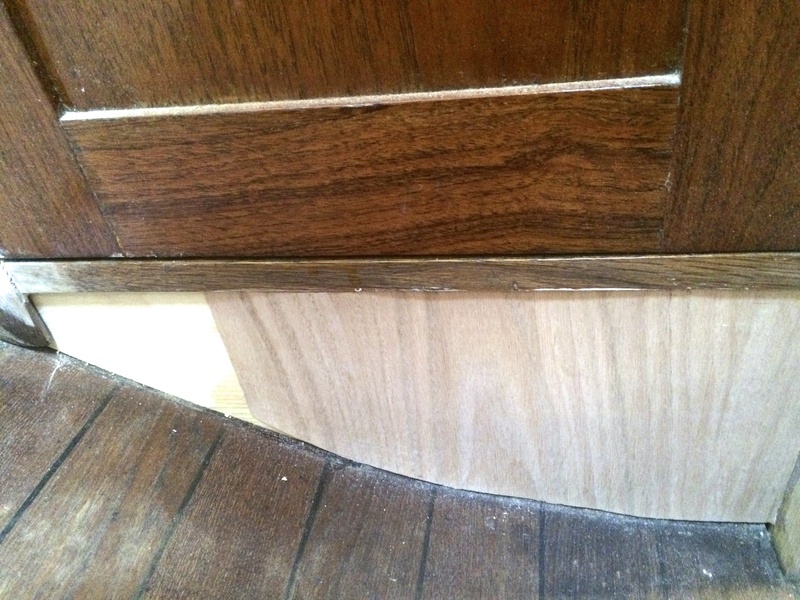 In addition to the work with the chisel, which I had not used in close to twenty years, I had to take the belt sander to the top and side of the door. the fit better than before! until I tried to latch it. The door latch had to be moved over over a 1/4″ as it hit the door jam, easier said than done, but in the end everything worked very smoothly. Next I had to trim an inch off the teak shower grate as I added a 3/4″ piece of marine ply to the forward end of the shower pan to cover some treated rot that had to be dug out. 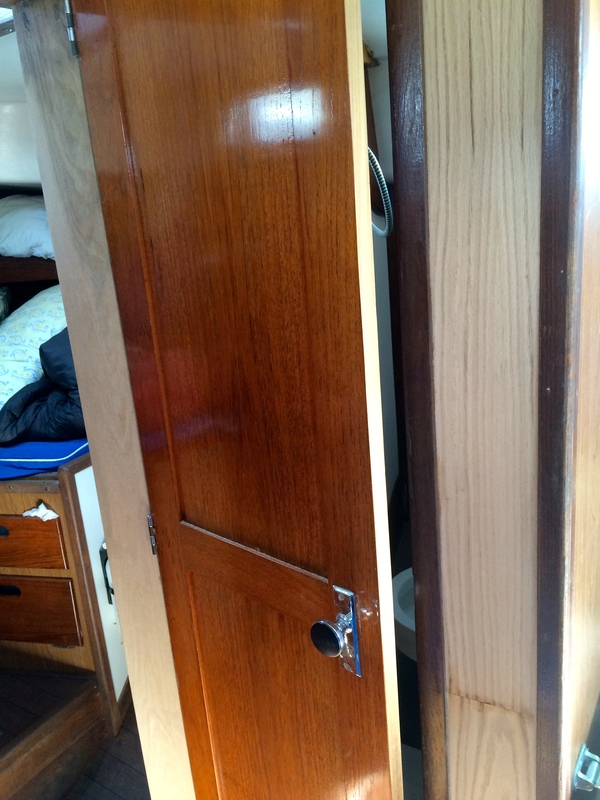 It’s been a long time since I worked on the boat yard in the UK, and I had forgotten how tough it is to cut Teak, I really should have bought a new blade for the Skill Saw before I went down there. 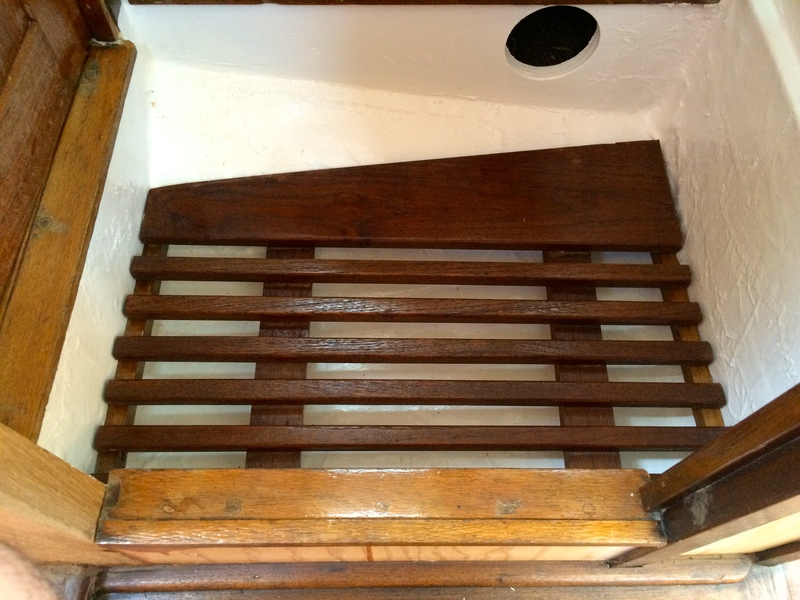 But it ended up looking “Grate” with a new coat of teak oil. Once the door and the grate were in place I was able to start adding veneer to the Douglas Fir faced marine ply. I had purchased a couple of 2’x8′ rolls of the paper backed Red Oak at the lumber yard and some contact cement from Lowes. 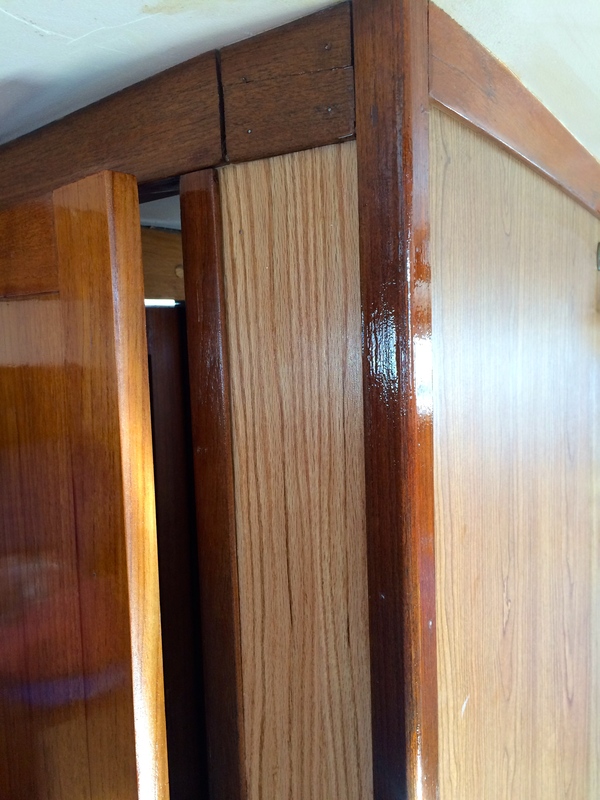 my hope was that with a couple of coats of varnish they will give me more of a traditional feel below verses the formica that is so typical of ’70s yachts. After some fiddly cutting I had the first two pieces in place. The wind was still blowing 15-20 mph by Thursday morning so Jean decided to stay home so I set to work on the rest of the veneer and the Varnish. 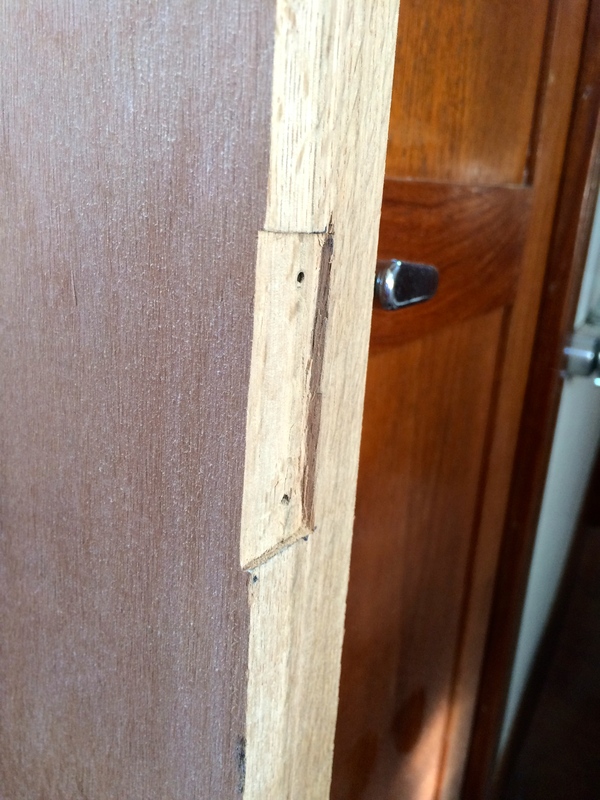 I had to cut the long vertical piece along the side of the door, I made a mistake here and did it in two pieces as I didn’t want to open a second roll, but I figured that after the varnish was applied it would darken the oak enough that the seam would not be apparent. 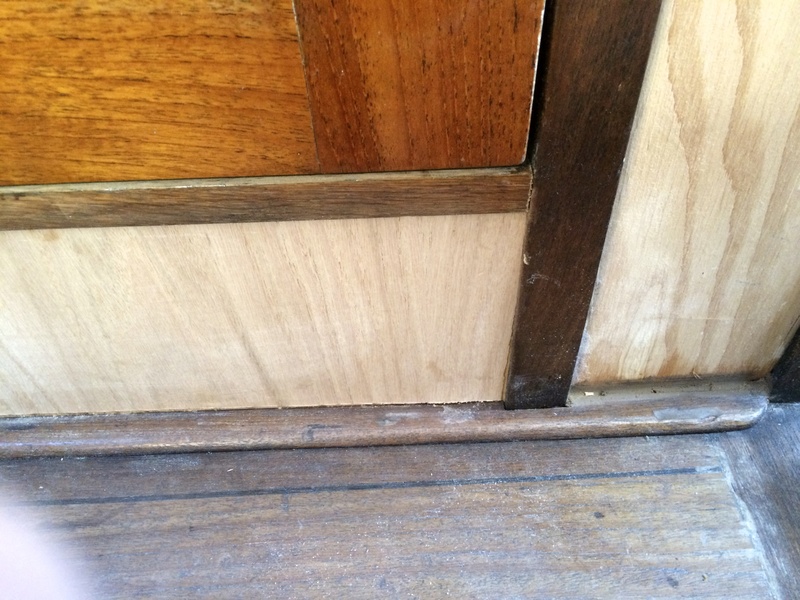 The problem was that the Oak veneer did not darken as much as the solid compression post after the varnishing. 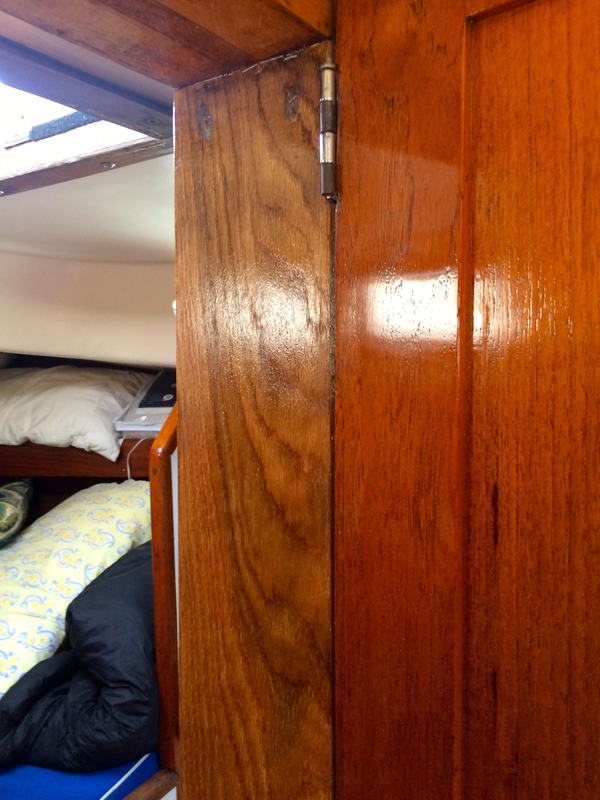 It will do for now but I think that I will go back over it with some mahogany and do the whole cabin the same way, a bit at a time. The compression post looked fabulous after the varnish was applied. Overall the project took six days and cost about $400. ← Construction and Clean Up! Excellent work, Adam. Your carpentry skills don’t seem to have suffered much at all from a 20 year hiatus. And $400 of materials and your time translates to about $2000 of boat yard mark-up and labor. You did very well. I’ve found that using a darker brown stain in combination with a reddish colored stain will approximate the color of teak fairly well. I apply the dark brown first, then highlight with red. Walnut and red oak – I know, you used red oak, but the color from the can adds shading on top of the dark that you can’t get otherwise. But mostly, it’s an experiment-and-see sort of thing, and you don’t have to do it quickly. You can take your time in the application and try several different tints if the ones you used already don’t satisfy.